I started my Project with some figures from Ebay. For the first games there were OK. But now I paint some miniatures. I don't like to paint and I have too much other Hobbies. On the other Hand I'm to pedantic. I changed some Areas on my figures and painted some figures to match with HoW. Here is my first bn. of the Regiment Bayreuth. 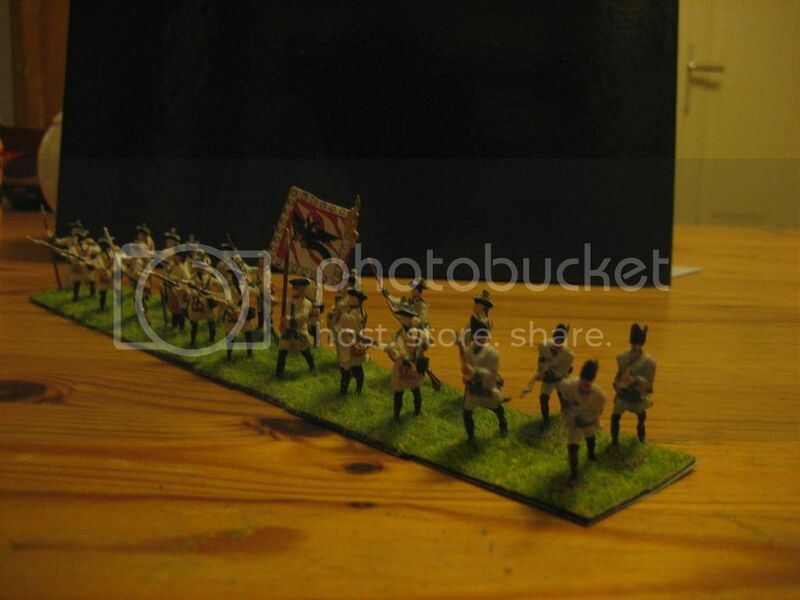 The Grenadiers follow a painting by Morier with a Grenadier of a not identified regiment. 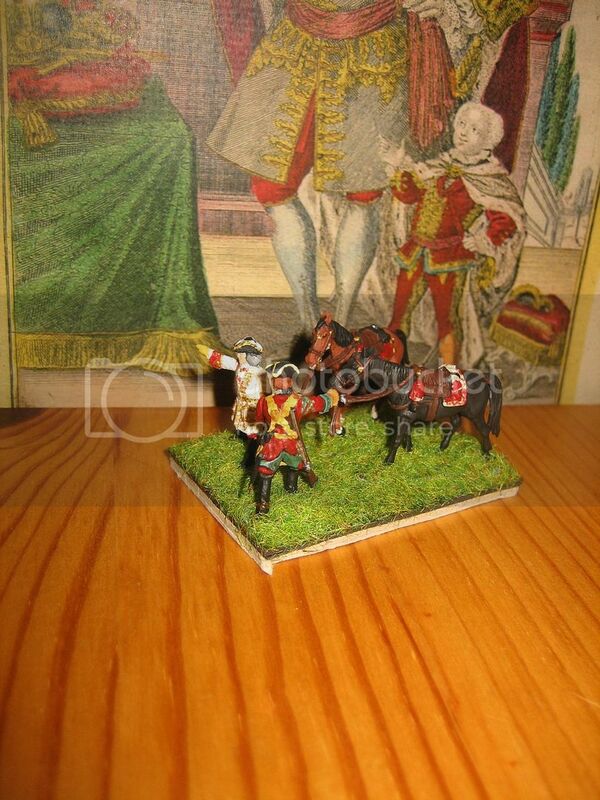 But this Grenadier Looks the same like the uniform of the Regiment in 1756. 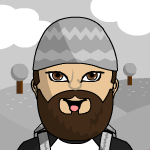 The flagbearer is by zvezda. 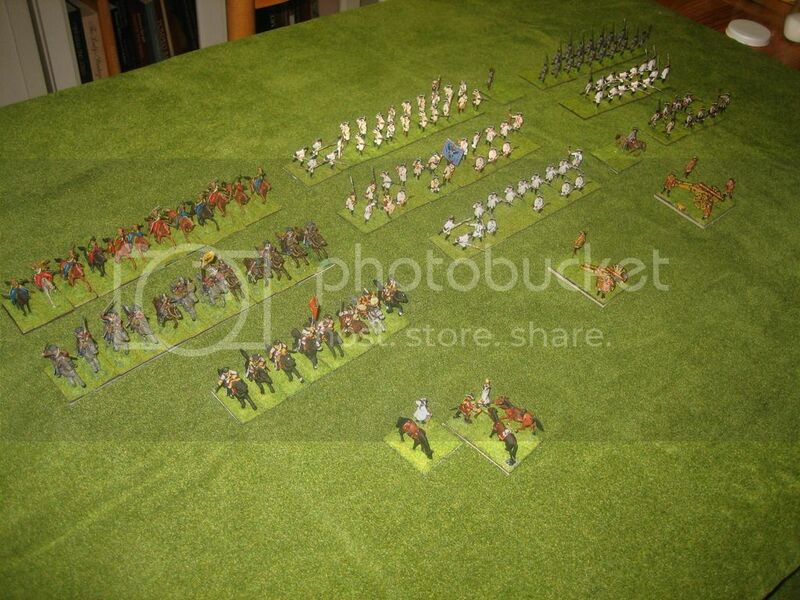 The fuseliers are by Revell. 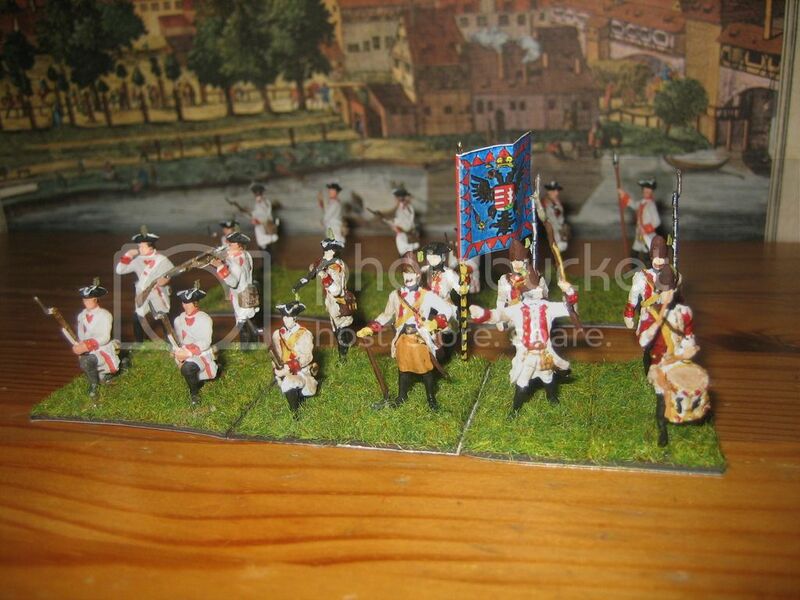 Now some figures of this set, the Drummer and some fuseliers are a real nightmare to paint. No clear lines and a lot of vague Areas of plastic around the arms. The officer and the Grenadiers are OK. All in all I will be really happy when I painted all 4 boxes I have. They were cheap and therefor the result is OK.
Don't worry too much about painting details, after all, most of the time figures on the table are being viewed at wargamer's distance, so fine details disappear. You will also find that painting improves with practise. A dragoon of the regiment Styrum helps the general with the horses (although normaly you may only see cuirassiers around the fieldmarshalls). I love the poses of these figures. So I had to choose them. By the way: the FM must be from the highest rank as he has the order of the golden fleece on his breast (knights of this order had to wear this all the time of their life!). Thank you very much! Now I have to make a break on my painting table. 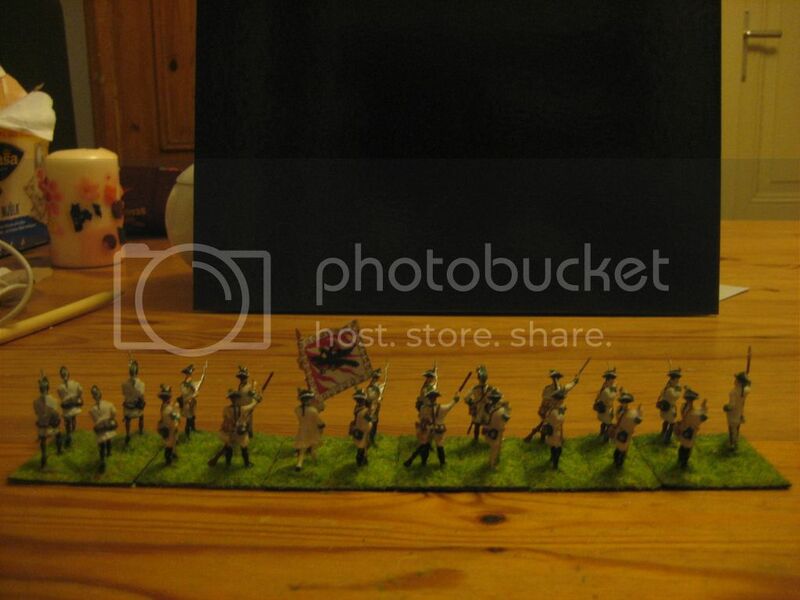 Too many reenactment projects for the next weeks although I want to finish my regiment Arenberg. The first bn. of the regiment Arenberg is my new unit. The colours follow the painting by Morier. Here comes my first Generalfeldwachtmeister (GFWM). The officer himself is from Revell. I think that's the best 7-years-wars-output this manufacturer ever produced. All details are clear and the hat is much better than the hats of the infantry set by the same manufacturer. 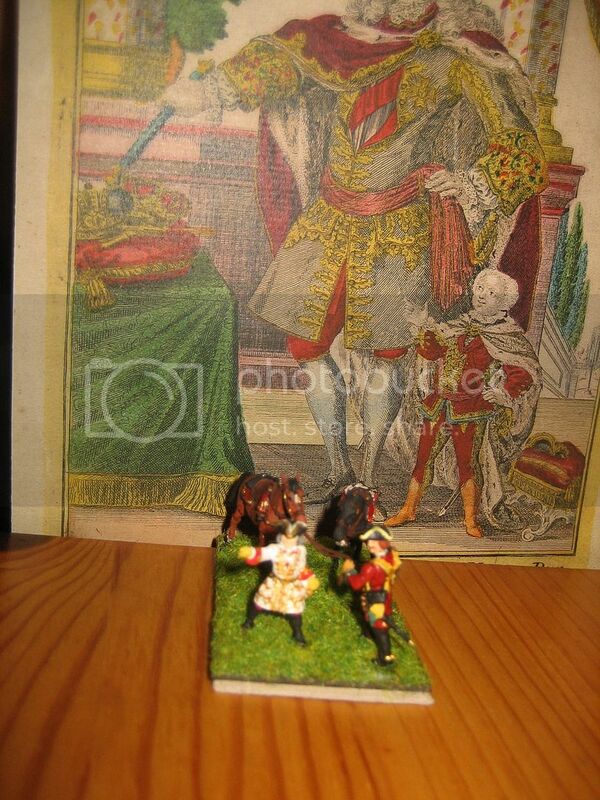 Wonderful looking command figure; so Austrian, so haughty. 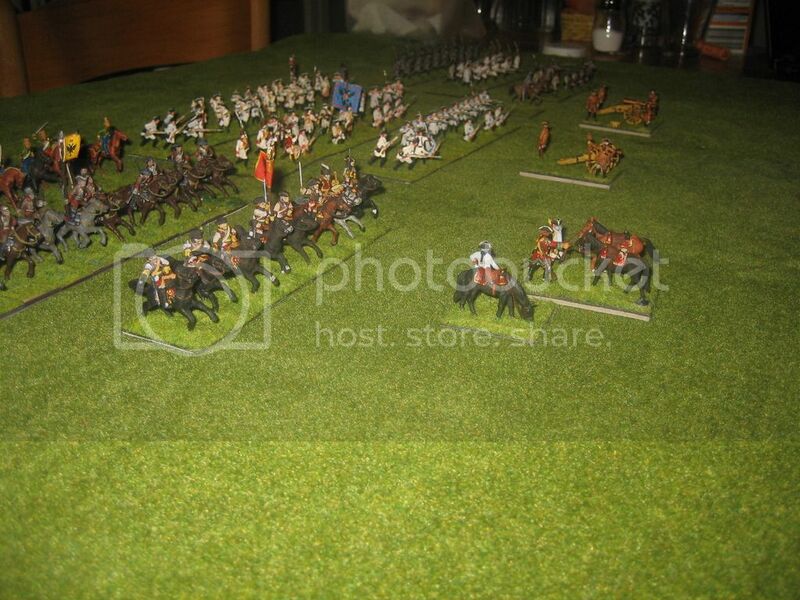 On the 13th of may the fieldmarshall Traun had a big Parade with all my troops. You can see him arguing with a GFWM over the new squadrons he is waiting for. The unit is painted after the paintings of Morier and the pictures by Gudenus. Morier didn't painted lace on the tricornes but Gudenus did. 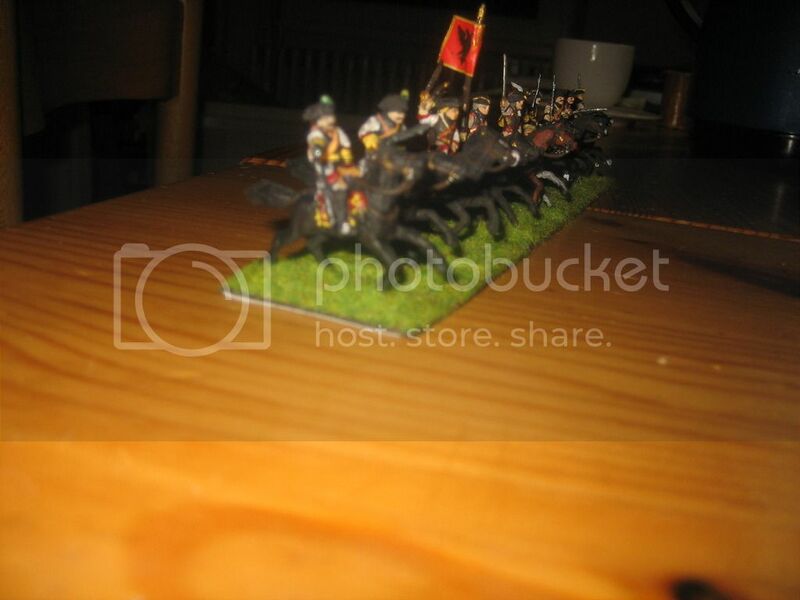 So I choosed to give my two carabiniers yellow lace and the normal cuirassiers no lace. The musician has a red uniform because many regiments under Charles VI. had red uniformed musicians. 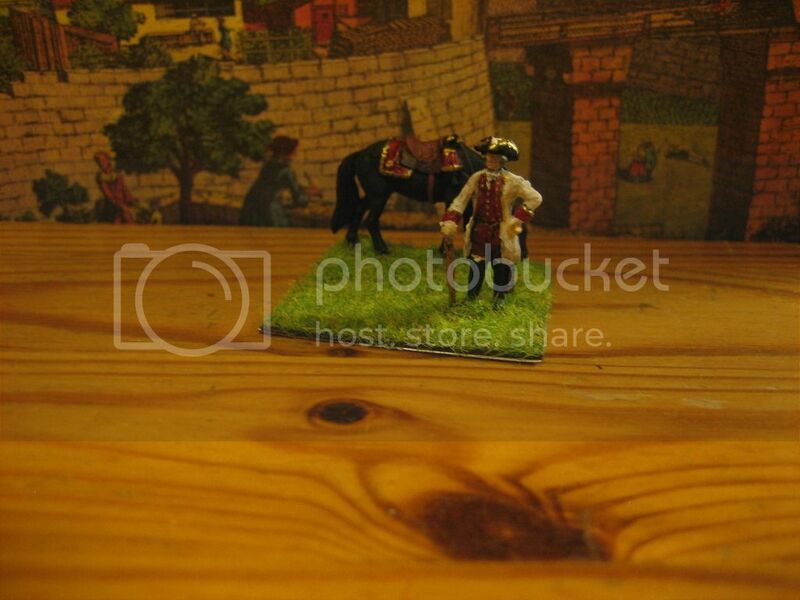 The Special headgear follows a Picture on Xenophon-mil with the cuirassiers under prince Eugene. It's the Darth Vader response: impressive. Very nice army and I hope it brings you hours of fun,do you think you will be able to find pandours in plastic or are you good with a scalpel. There are some pandours (grenzers) from Germania-Figuren, I will use. In comparison with the Zvezda-stuff they are realy expensive (except the sets sold off), but I will only paint 2 Units of 6 minis per unit. But I will work a lot with the scalpel. I and my wife changed the swedish riders because they had helmets: www.plasticsoldierreview.com/Review.aspx?id=825 Now they have all hats. 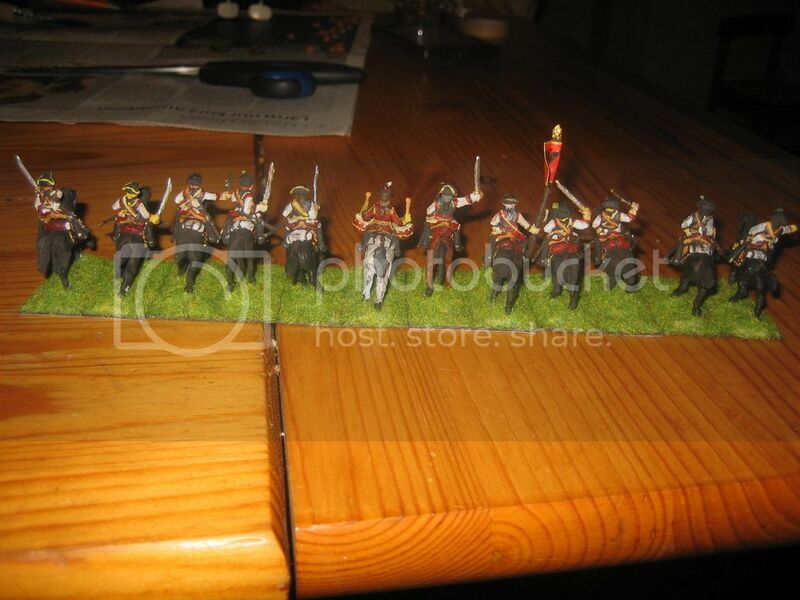 In two or three months I will change some dragoons from Revell too and give them Grenadiercaps. That is the wonderful thing with plastic figures,plus if you mess up they can always be used as a casualties figure.Keep up your enthusiasm and enjoy what your doing.